The gradual shift towards the much vaunted Smart Grid structure has been gathering steam in the last few years. While much of the excitement has been generated from the immense potential of what a fully completed Smart Grid system can bring (for example, higher reliability at reduced cost), Grid operators, independent power producers and their team of engineers are facing real difficulties in implementing such systems today. It is easy to talk about wanting to implement technologically advanced systems, but when it comes to actually executing the projects to implement such solutions, the complexity surrounding such implementations comes to the fore. Much of this complexity arises because of the vast variety of applications within the industry. It is particularly difficult to find the right set of products that are suitable for the application, reliable, fast to set up and easy to manage. For example in Transmission and Distribution substations, there will minimally be systems for transformers, shunt reactors, switchboards, intrusion detection monitoring systems and each of these systems can consist of smaller sub systems. For example, in monitoring a switchboard, we can monitor downstream load current for energy balancing; micro current fluctuations for signs of partial discharge or even for predictive maintenance; door contact monitoring for physical security and the list goes on. Each of these systems will require the right set of products and will have to be linked in this web of madness. Imagine the chaos! At Phoenix Contact, we recognise this difficulty. While we have many solutions for Energy Industry that we are always sharing with the various stakeholders, in this series of blog articles, we will be examining how we help to simplify the implementation of Smart Grid. We will do so by examining the building blocks of a system – the individual panels which form up a system; and we will do so box by box. This first article will be about LV Compartment of MV Switchgear and we will delve straight into the 3 problems switchgear builders and grid operators are facing! Problem 1: How do I collect signals from my switchgears and transform it into IEC61850? There are a lot of copper wires going out of the panel or into numerical relays. The associated cost includes requiring marshalling or pilot cabinets and related components and regular maintenance to check if the connections are good. In addition, it is difficult to isolate where the fault is when there is a loss of signal. In the worst case scenario, there might even be accidental shorting resulting in severe downtime! Numerical relay and its I/O cards are expensive. These result in higher initial cost and higher eventual maintenance cost with downtime not necessarily minimized, especially in the event of loss of signal. Using of a Bus coupler capable of communicating via GOOSE and MMS will solve both of these problems. 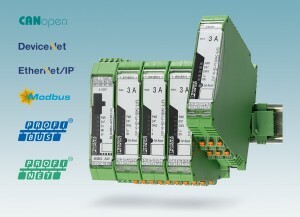 Using Phoenix Contact bus coupler as an example, the signals can be easily inserted and aggregated as IEC61850 data. It certainly reduces the number of cables leaving the cabinet and with the light indicators, you can see clearly which connections are good without requiring extra tests. It is also of lower cost compared to numerical relays’ IOs while communicating perfectly with them. Problem 2: There are too many wires, how can we manage them better? Being the founder of the original ceramic terminal block, it is already tempting to say that Phoenix Contact is the best at solving this! But in the last few years, we have developed more data connectors to put us in a better position to solve this for switchgear builders! We have an extremely wide range of terminal blocks for every applications and needs. We have demonstrated to be able to meet each and every customers’ unique demands, be it requiring pluggable solutions, fastest connection technology, space saving, you name it, we’ve done it! In this article, we would just like to highlight how a commonly used connector for switchgears has developed to adapt to Smart Grid. In the past, our Heavycon (heavy duty connector) was often sold to connect the LCC and Bay cabinets. This enabled quick connection on site. However, these connectors are usually for loose copper wires only. Although you can strip an Ethernet/serial connector to use such connectors, these connectors does not cater very well for the shielding required for data connector. Therefore, Phoenix Contact has developed a modular connector, allowing you to use your data connectors directly! This modular connector even allows you to have connectors which allow for high power! Problem 3: With more signals being collected, there will be more testing to be done. How can we ensure we are safely doing the testing all the time! Every so often, testing needs to be done on the current transformers and voltage transformers regularly. For current transformer especially, if not done right, explosions can happen. Currently, the shorting and breaking of circuits are done manually by hand (yes you read that right) and as you can imagine, explosions lead to death. To solve this, Phoenix Contact has developed our test disconnect system (FAME) where shorting is done automatically and it is fool-proof! Instead of using terminal blocks that are switched manually, you can replace it entirely with FAME and from then on, every testing procedure will be done how it is meant to be done: SAFELY. We have assembled this product into a demo box along with other products that Phoenix Contact offers for LV Compartment for MV Switchgear. If you will like to have a look at the demo box up close, do contact us using the form below and we will get in touch! Safety is by Choice, Not by Chance. Are you selecting a safety relay just to meet the SIL3 requirements? Who will be responsible for conducting the Proof Test to ensure it is still safety relays are still safe to use? Which is critical? Safety relays without diagnostics or the Safety relays with diagnostics? The graphics below explains the functional principle of the force guided /positive driven contacts in the event of a welded contacts and that’s where the normally closed contacts come into action to provide feedback to inform the system of the failure in relay contacts. In this case when the relay is de-energized, the normally closed contact cannot close properly having a gap of 0.5mm. The diagram below shows connection details for a safety relay used by Fire & Gas Systems. The Fire & Gas System is always on standby mode and it becomes more important to have multiple diagnostics to make sure the Fire and Gas System Safety Relay is still functional and all wirings are connected. Diagnostics for lost power input to field devices: Beacons, Solenoid Valves, Fire Alarm Bell. Short circuit field device diagnostics. Diagnostics for any welded contacts. Proof Test points (TP1, TP2, TP3) without the use of external power. All diagnostics via the same cable (A1,A2) by the use of test pulse filtering. Option for redundant connection (A1’, A2’). If you have sales enquires to know more about this product, please feel free to send me an enquiry and a sales visit can be arranged to discuss in more detail. Trying to save cost by using less cabinets or smaller junction boxes in order to better optimize your plant in terms of space as well as maximized the energy and cabling installation cost for signal conditioning? 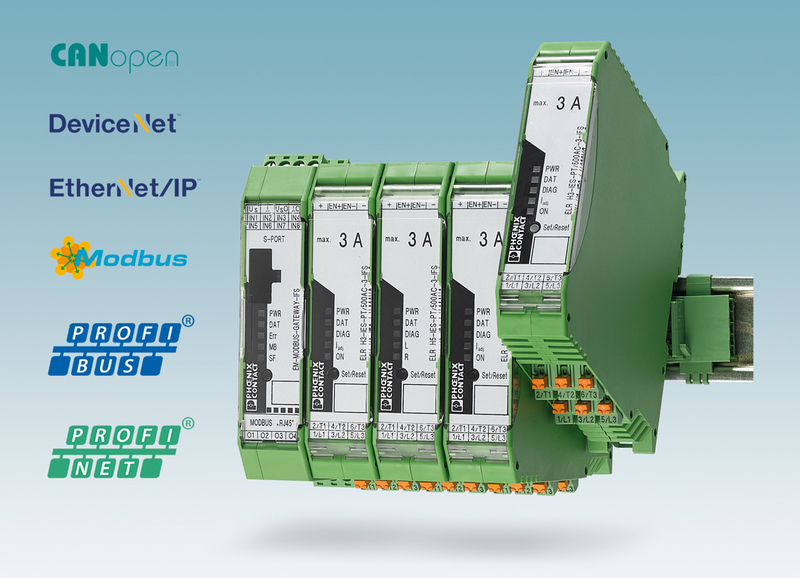 Phoenix Contact’s MACX / MINI Analog is your solution. Phoenix Contact has an Innovative way to maximized space, wiring installation and energy cost for better return of your plant investments. User Benefit: Longer operational lifetime of the devices and less ventilation of the cabinet required resulting in savings in energy cost. User Benefit: Reduced wiring for power distribution, fast installation, hot-swap replacement, expansion-options by bridging and saves time and money! 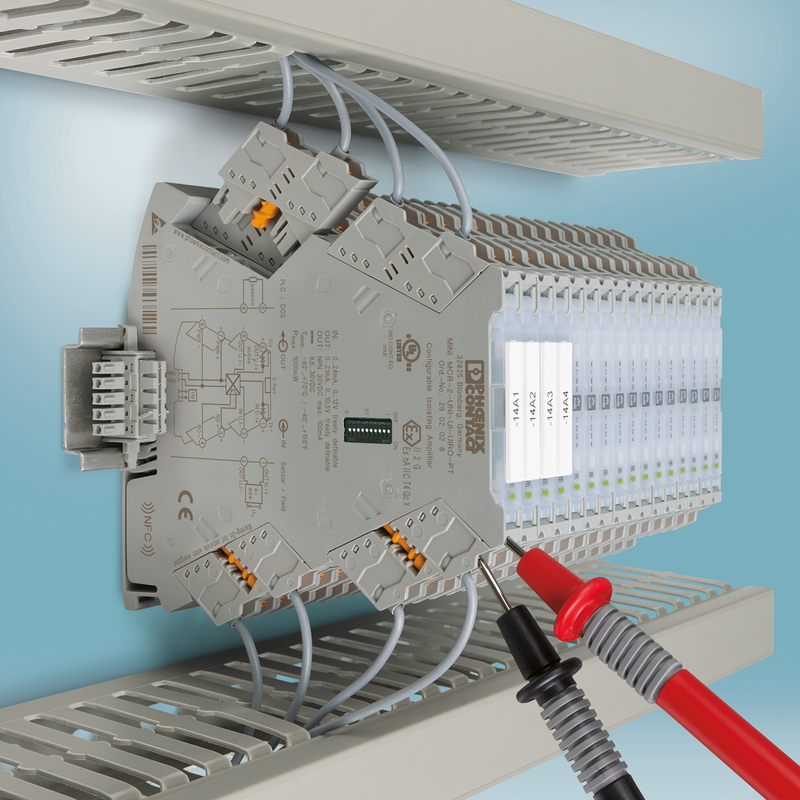 From highly compact 12.5 mm signal conditioners and functionally safe signal conditioners to signal isolators for intrinsically safe circuits in hazardous areas, Phoenix Contact signal conditioner range offers a solution for all applications in Analog signal conditioning. Space savings in the cabinet up to 30% space. Longer operational lifetime of the devices and less ventilation of the cabinet required resulting in savings in energy cost. Reduced wiring for power distribution, fast installation, hot-swap replacement, expansion-options by bridging and saves time and money! If you would like to know more about this product, please feel free to send me an enquiry and a road show can be arranged to discuss in more detail with your team.